New research from the Center for American Progress shows that LGBT people across the country continue to experience pervasive discrimination that negatively impacts all aspects of their lives. In response, LGBT people make subtle but profound changes to their everyday lives to minimize the risk of experiencing discrimination, often hiding their authentic selves. Over the past decade, the nation has made unprecedented progress toward LGBT equality. But to date, neither the federal government nor most states have explicit statutory nondiscrimination laws protecting people on the basis of sexual orientation and gender identity. LGBT people still face widespread discrimination: Between 11 percent and 28 percent of LGB workers report losing a promotion simply because of their sexual orientation, and 27 percent of transgender workers report being fired, not hired, or denied a promotion in the past year. Discrimination also routinely affects LGBT people beyond the workplace, sometimes costing them their homes, access to education, and even the ability to engage in public life. Data from a nationally representative survey of LGBT people conducted by CAP shows that 25.2 percent of LGBT respondents has experienced discrimination because of their sexual orientation or gender identity in the past year. The January 2017 survey shows that, despite progress, in 2016 discrimination remained a widespread threat to LGBT people’s well-being, health, and economic security. 68.5 percent reported that discrimination at least somewhat negatively affected their psychological well-being. 43.7 percent reported that discrimination negatively impacted their physical well-being. 47.7 percent reported that discrimination negatively impacted their spiritual well-being. 38.5 percent reported discrimination negatively impacted their school environment. 52.8 percent reported that discrimination negatively impacted their work environment. 56.6 report it negatively impacted their neighborhood and community environment. David is not alone. Survey findings and related interviews show that LGBT people hide personal relationships, delay health care, change the way they dress, and take other steps to alter their lives because they could be discriminated against. Maria S.,* a queer woman who lives in North Carolina, described a long commute from her home in Durham to a different town where she works. She makes the drive every day so that she can live in a city that’s friendly to LGBT people. She loves her job, but she’s not out to her boss. “I wonder whether I would be let go if the higher-ups knew about my sexuality,” she says. CAP’s research shows that stories such as Maria’s and David’s are common. The below table shows the percentage of LGBT people who report changing their lives in a variety of ways in order to avoid discrimination. 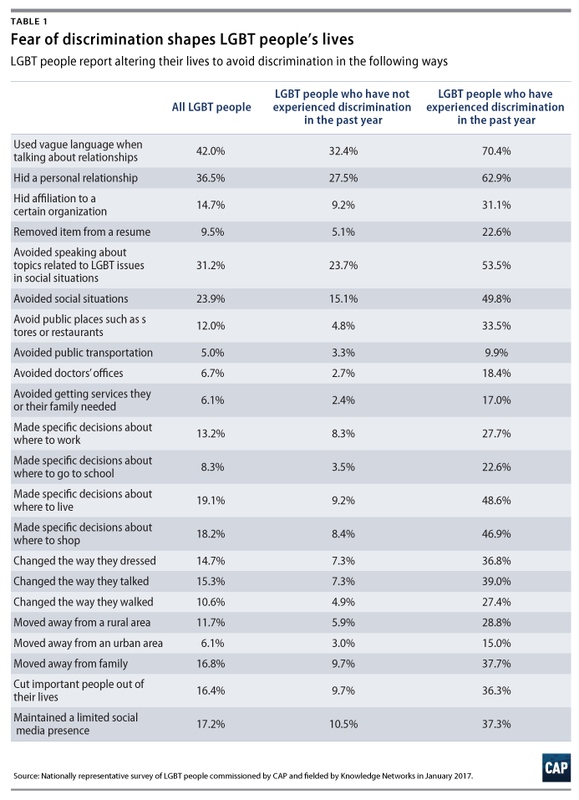 As Table 1 shows, LGBT people who’ve experienced discrimination in the past year are significantly more likely to alter their lives for fear of discrimination, even deciding where to live and work because of it, suggesting that there are lasting consequences for victims of discrimination. Yet findings also support the contention that LGBT people do not need to have experienced discrimination in order to act in ways that help them avoid it, which is in line with empirical evidence on a component of minority stress theory: expectations of rejection. Within the LGBT community, people who were vulnerable to discrimination across multiple identities reported uniquely high rates of avoidance behaviors. In particular, LGBT people of color were more likely to hide their sexual orientation and gender identity from employers, with 12 percent removing items from their resumes—in comparison to 8 percent of white LGBT respondents—in the past year. Similarly, 18.7 percent of 18- to 24-year-old LGBT respondents reported removing items from their resumes—in comparison to 7.9 percent of 35- to 44-year-olds. Meanwhile, 15.5 percent of disabled LGBT respondents reported removing items from their resume—in comparison to 7.3 percent of nondisabled LGBT people. This finding may reflect higher rates of unemployment among people of color, disabled people, and young adults; it may also reflect that LGBT people who could also face discrimination on the basis of their race, youth, and disability feel uniquely vulnerable to being denied a job due to discrimination, or a combination of factors. Discrimination, harassment, and violence against LGBT people—especially transgender people—has always been common in places of public accommodation, such as hotels, restaurants, or government offices. The 2015 United States Transgender Survey found that, among transgender people who visited a place of public accommodation where staff knew or believed they were transgender, nearly one in three experienced discrimination or harassment—including being denied equal services or even being physically attacked. These findings suggest that ongoing discrimination in public accommodations pushes transgender people out of public life, making it harder for them to access key services, use public transportation, or simply go to stores or restaurants without fear of discrimination. This is likely because, in addition to the risk of anti-LGBT harassment and discrimination, LGBT people with disabilities contend with inaccessible public spaces. For example, many transit agencies fail to comply with Americans with Disabilities Act, or ADA, requirements that would make public transportation accessible to people with visual and cognitive disabilities. In 2010, more than half of LGBT people reported being discriminated against by a health care providers and more than 25 percent of transgender respondents reported being refused medical care outright. Since then, LGBT people have gained protections from health care discrimination—most notably, regulations stemming from the Affordable Care Act, or ACA, have prohibited federally funded hospitals, providers, and insurers from discriminating against LGBT patients. Despite progress, LGBT people, and transgender people in particular, remain vulnerable to healthcare discrimination: In 2015, one-third of transgender people who saw a health care provider reported “at least one negative experience related to being transgender.” These negative experiences included being refused treatment or even being physically assaulted. Transgender people of color and people with disabilities reported particularly high rates of discrimination from health care providers. These findings are consistent with research that has also identified patterns of health care discrimination against people of color and disabled people. For example, one survey of health care practices in five major cities found that more than one in five practices were inaccessible to patients who used wheelchairs. To ensure that federal civil rights laws explicitly protect LGBT people, Congress should pass the Equality Act, a comprehensive bill banning discrimination based on sexual orientation and gender identity in employment, public accommodations, housing, credit, and federal funding, among other provisions. 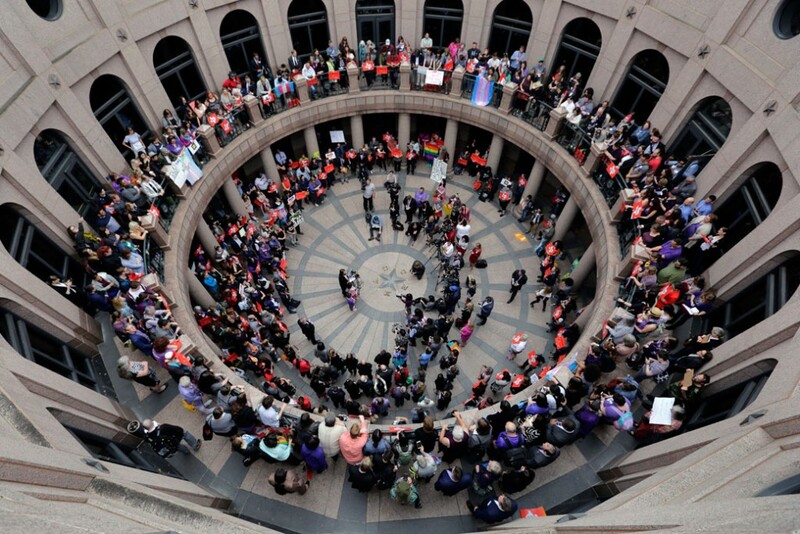 Likewise, state and local governments should pass comprehensive nondiscrimination protections for all. Comprehensive nondiscrimination protections have more support from voters than ever before: A majority in every state in the country support nondiscrimination laws. While comprehensive nondiscrimination protections won’t prevent all instances of discrimination, they are a critical way to hold employers and landlords accountable. Additionally, they send the message that LGBT people are both accepted and respected by all levels of government. LGBT people deserve the opportunity to live full, equal, and authentic lives—and that won’t be possible while discrimination remains a looming threat to LGBT people and their families. Sejal Singh is the Campaigns and Communications Manager for the LGBT Research and Communications Project at American Progress. Laura E. Durso is the Vice President of the LGBT Research and Communications Project at American Progress. *Authors’ note: All names have been changed out of respect for interviewees’ privacy. To conduct this study, CAP commissioned and designed a survey, fielded by Knowledge Networks, which surveyed 1,864 individuals about their experiences with health insurance and health care. Among the respondents, 857 identified as lesbian, gay, bisexual, and/or transgender, while 1,007 identified as heterosexual and cisgender/nontransgender. Respondents came from all income ranges and are diverse across factors such as race, ethnicity, education, geography, disability status, and age. The survey was fielded online in English in January 2017 to coincide with the fourth open enrollment period through the health insurance marketplaces and the beginning of the first full year of federal rules that specifically protect LGBT people from discrimination in health insurance coverage and health care. The data are nationally representative and weighted according to U.S. population characteristics. All reported findings are statistically significant unless otherwise indicated. All comparisons presented are statistically significant at the p < .05 level. Separate from the quantitative survey, the authors solicited stories exploring the impact of discrimination on LGBT people’s lives. Using social media platforms, the study authors requested volunteers to anonymously recount personal experiences of changing their behavior or making other adjustments to their daily lives to prevent experiencing discrimination. Interviews were conducted by one of the study authors and names were changed to protect the identity of the interviewee. Additional information about study methods and materials are available from the authors.